Whenever I shop for shoes, I tend to play it safe and purchase plain black shoes because, well, they go with pretty much every outfit I own. I make no apologies. However, I do often suffer from shoe envy. Granted my Flintstone feet, as my husband likes to call them, make it quite to find shoes that fit so I'm often left with few choices. Until I started scouring Amazon.ca, that is. I recently came across their Ultimate Fall Shoe Guide that features tall boots, workday favourites, boots under $100, and more, and found some super cute footwear. And no, they're not all black! 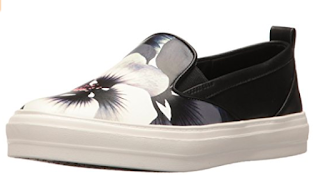 Nine West Women's OLSEN3 Fashion Sneakers - As a full-time teacher mom who is constantly on the go, I have no problem ditching the pumps for sneakers. And these adorable fashion sneakers would be perfect! I also love that they are on sale for $56.58. That's almost half price! Plus, they qualify for Prime shipping and free returns. 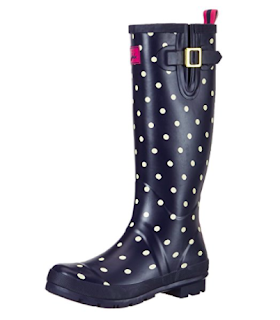 Joules Women's Welly Print Rain Boot - As much as I despise the rain, a pretty pair of rain boots can make it all the more tolerable. The great news is these boots are under $100 and qualify for free shipping. I like this navy spot design but there are literally dozens of other colours to choose from. Steve Madden Women's Court Bootie - For the longest time, I have been on the hunt for a casual ankle boot that isn't black. 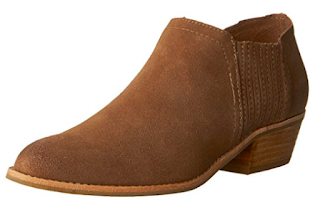 These slip-on booties, which cost $113.68 and qualify for Prime shipping and free returns, look perfect for those crazy mornings when I'm running late. Theoretically, that is. I never run late. Pajar Canada Women's Alina Boot - Last on my Amazon.ca wish list are these beautiful ice white boots that will be perfect for winter as well. I've been lusting over Pajar boots for a couple of years and now that my daughter has grown into my old boots, I have the perfect excuse reason. Am I right? These boots retail for $172.31 on Amazon.ca and qualify for Prime shipping, as well as free returns. 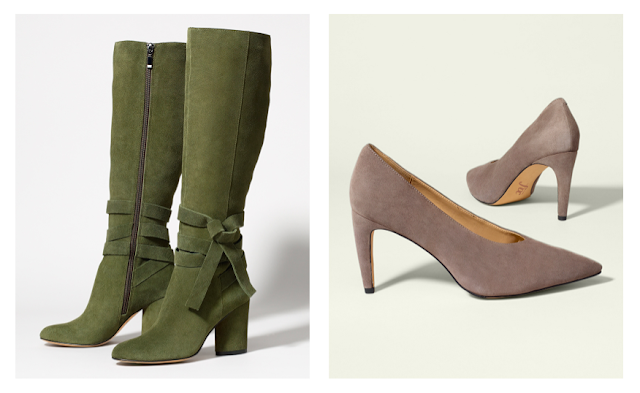 Have you spotted a pair of must-have fall shoes or boots on Amazon.ca? Here's your chance to win a $100 Amazon.ca e-gift card! Complete the Rafflecopter form below to be eligible. Open to residents of Canada only, excluding Quebec. Disclosure: I have partnered with Amazon.ca to bring you this post, which contains affiliate links, and have received special perks. Any opinions expressed in this post are my own. But I ADORE those green boots in the pic above! An item on my wish list is an Instant Pot. Right now on my wish list is the MEGAVISION Waterproof LED Fairy lights 138 Bulbs 12 Star Shaped Curtain Lights, they are very pretty! 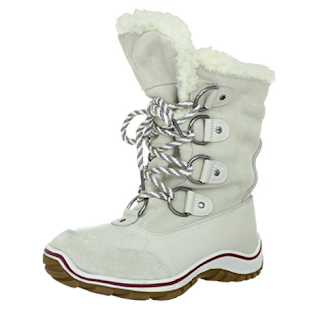 I really like the ZHIHONG Womens Winter Fur Snow Boots! Thanks! A new camera is on my wishlist. The book "The Great Influenza: The Epic Story of the Deadliest Plague in History" is on my wishlist. I love the Steve Madden women's court bootie. An instant pot is on my list of items. Always on my list is a kichen aid mixer! I bake almost everyday for our gluten free family. Love the boots! I love NOW Foods Liquid Flavoured Stevia. I use their English Toffee, Cinnamon Vanilla and Lemon flavours most days. If I win I'll definitely stock up. I have quite a number of cookbooks ony Amazon wishlist right now. An item on my Amazon wishlist is the Cuttlebug die cutting and embossing machine. Books are on my list. With a gift card I could actually buy some books that cost more then 99 cents. I would love a new watch. I haven't had one for years now. I have the Nintendo Switch one my Amazon wishlist. The kids aren't into it enough to justify the cost right now but I want to play the new Mario games! My camera just broke on me , so that is on the top of my wish list now ! I can't be with out my camera !! We live in the country and I would love to have a drone. I think we would have a lot of fun with the grandkids experimenting with it. Thanks for the super giveaway opportunity. I have the book Understood Betsy on my wish list. Apparently it's a classic and I've never read it. Love Amazon but n get thought to look for shoes! Will check it out. The Fuji mirrorless camera at Amazon is on my wish list. I like the Steve Madden court boot.The colour is great and they would be easy to walk in. These adorabe Moc slippers are on my list! Oh my Amazon wish is a medium sized Himalayan salt lamp! I would love a pressure cooker and will be scouting the wide amazon website for good deals. I'm eyeing for a good deal on the instant pot! I have some attachments for my kitchenaid mixer on my amazon wish list! One item that is on your Amazon.ca wish list is a Nespresso machine! A pair of Hunter Boots Women's Original Short Classic Rain Boot is on my WishList for our rainy west coast Fall/Winter! A new purse is on my wishlist! On my wish list is a pair of Comfy Moda Women's Winter Boots Australia 100% Genuine Shearling boots Cold Weather Pull On. I don't literally have a wish list on Amazon but I can tell you I would love books like The Chemist! I would love a pair of tall boots. I have a salt and pepper grinder on my Amazon wish list. I need some new boots for winter so I would definitely get them if I won! I have winter boots, gifts for Christmas, and a winter coat on my amazon wishlist. Thanks! I really need a new monitor this Christmas. I'd like a new coffeemaker! The main thing on my Amazon wish list is the Seagate Backup Plus Slim 2TB Portable External Hard Drive USB 3.0 to back up all my files utilizing that 2TB of storage! The Portable washing machine is on my wish list . Do not own washer or dryer so I hand wash everything. Everything is on my wish list..but especially an instapot! I really want a new pair of running shoes. I love to run and go through so many. I need a new pair. I need a new tablet but I haven't done any research yet, I would use the $100 towards it! I would use this towards my aeromax 300 air purifier by Fellowes I have in my wishlist . I need a new kindle! I need an iPad and some dvds for my classroom. The Aerosoles Women's Geneva Boots are on my wish list. A new pair of Keen shoes! I've been looking at some Hunter Boots! We need a new TV, but for amazon, I like to order a lot of low carb grocery items that I can't find locally. I would like a new blender from Amazon. An instant pot is my most wanted amazon item! I have been dying to try the nono hair removal tool for years. Definitely on my wishlist. I have an Instant Pot on my wishlist. A kindle paperwhite is on my wish list. I have a kindle but it's old and doesn't have a light. I would love to have an Instant Pot for Christmas! I'd love to get my kids Harry Potter books illustrated by Jim Kay. I would get clothing for my daughter! I'd like a Google home, love how they are able to be a speaker, organizer and answer your questions! I'd put a Google home or Nest on my wishlist! An item on my Amazon wishlist is the Nintendo Entertainment System NES Classic Edition. I have a bunch of 3 Sprouts Storage Boxes on my wishlist. I'd love to organize this place a little bit. I'd love an Instant Pot but I also adore shoes and boots! The one thing on my wish list this year is a Samsung WAM 1500 Bluetooth speaker so I can listen to my music. I would love a new pair of leather boots from Amazon! I would love a new phone from Amazon! I need a fluorescent circle lamp and that's definitely on my wishlist. I need some new ear buds! I haven't decided on a brand yet! Entered as Rebecca Roberts, thanks! love a new diffuser for my condo along with some essential oils. The Clarks Women's Malia Willo Riding Boot is on my wishlist! A new camera is on my wishlist! A nice pair of warm winter boots with nonslip soles is what I'm looking for. I want to pick up some k-cups in bulk on Amazon. I find they are usually much cheaper that way. I have a tablet on my Amazon wishlist. I have a new turntable on my wishlist. I have a new stick vacuum on my wishlist for this year. I have an Instant Pot on my wishlist! I'd love to have an Ipad! I would like to order some new oils for my Berger Lampe. I would love the AGPtek® 16 Wand Bubble Machine Auto Blower For DJ Party Kids for my grandson. I want the breville belgian waffle maker. I want a pillow and a new comfy blanket set. On my Amazon.ca wish list is a bunch of vinyls. On the top of my wish list is, "Otis Redding: The Definitive Studio Album Collection". I've been wanting an iPad.